Mathews and his wife, who hails from Kerala, adopted the child from an orphanage in India. The girl was malnourished when the couple took her. A 3-year-old Indian American adopted girl from Richardson, Texas, went missing on Saturday early morning after her father allegedly ordered the toddler to stand out in the backyard at 3 am for not drinking milk. Wesley Mathews, 37, who adopted Sherin Mathews, has been arrested and charged with Abandoning or Endangering Child by the Richardson Police Department. Facebook post of Richardson Police Department says the father was released after he posted a bail bond of $250,000. According to the Police Department, the girl is suffering from developmental issues and has limited verbal communication skills. She was last seen by her father outside the family’s backyard in the 900 blk. of Sunningdale and wearing a pink top, black pajama bottoms. Mathews reportedly told police that he went outside about 15 minutes later to check on the girl, but she was gone. He added that he knew coyotes had been seen in the alley where he last saw her. However, the parents reported the incident to police only five hours later and the department is concerned about the delay in reporting, according to ABC News report. “We don’t have any other indication or evidence that she was forcibly abducted from that area,” ABC News quoted Sgt. Kevin Perlich. The police department is also reviewing the footage from CCTV cameras in the area; it has seized three vehicles, cell phones and laptops from the family. Numerous searches have been conducted around the neighborhood and surrounding areas. The searches involved the use of Reverse 911, trained search experts utilizing K-9 teams, helicopters, and door to door canvassing. “RPD investigators are actively working with several outside law enforcement agencies and specialized groups,” the Police Department’s latest Facebook update read. Mathews and his wife, who hails from Kerala, adopted Sherin from an orphanage in India. The girl was malnourished when the couple took her. 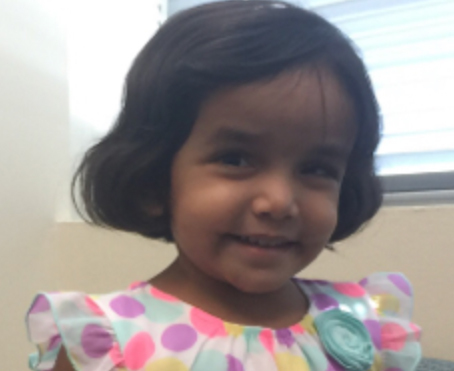 Sherin is approximately 36” tall and weighs about 22 pounds. The nbcdfew.com report quotes the neighbors and the local church, who all said that the couple loved their daughter very much. The community also got down to help the family to find the missing girl. The investigation is still continuing, and anyone with information regarding Sherin’s whereabouts is asked to contact the police at 972-744-4800.